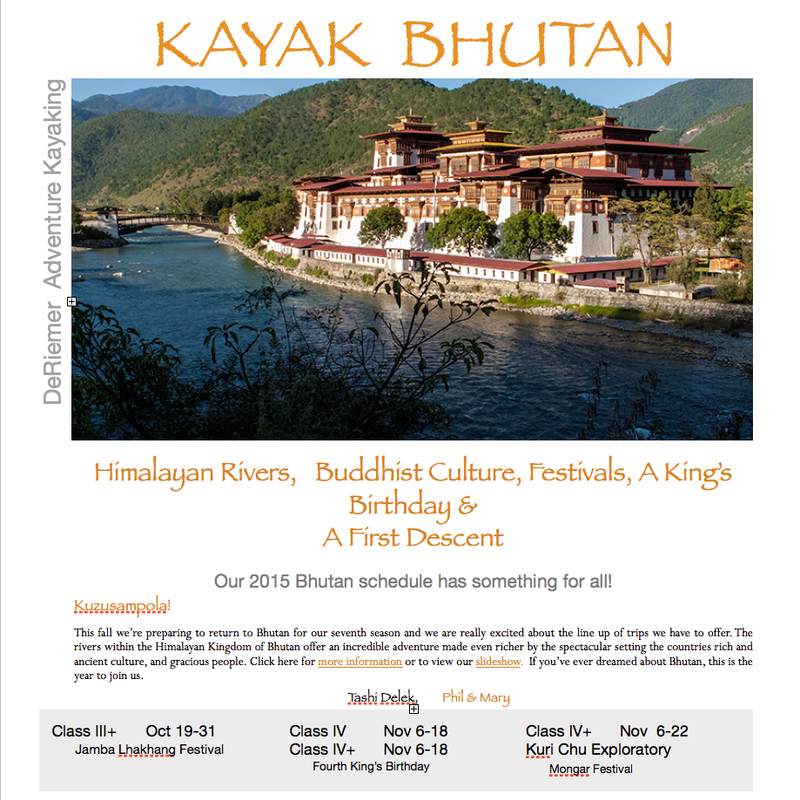 We’re planning a repeat of this section and all the classics across Bhutan Nov 6- 27th, 2016. We hope you’ll consider joining us. Cup o’ Joe, Ben scouts his first rapid of the day, day two. 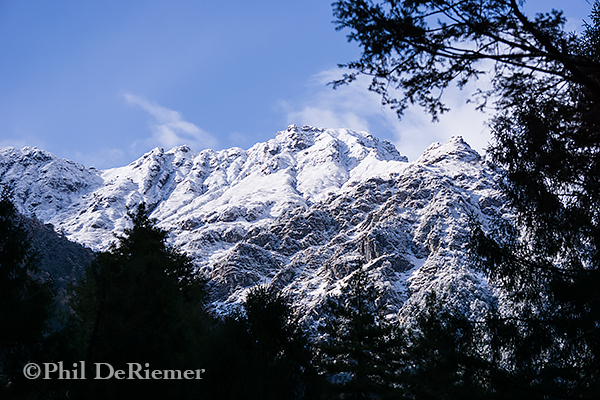 It was 3:00 PM, late November in eastern Bhutan. Day 1 of the first descent of the Kuri Chu. This was the hour we told ourselves we would start looking for camp. These deadlines are often better in theory than practice as we found ourselves in a section of canyon with near-vertical walls. Below us was a horizon line spewing mist. 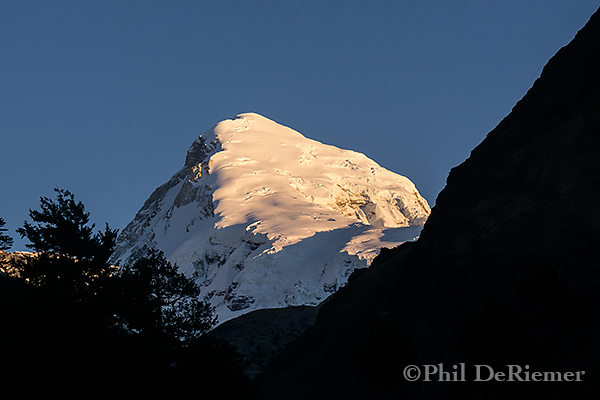 It wouldn’t be long before the low-angled sun would slip behind the ridge. It was beginning to look like we might be late for dinner. Just beyond the horizon line we could make out a spot where the entire river, all 4500 cfs of it, flowed through a gap not much more than 15 feet wide. This narrowing we expected from our Google Earth review of the river prior to the trip. We weren’t worried about it because we knew that it sat in a pool. It was this rapid that sat between us and that pool that was a surprise to me. 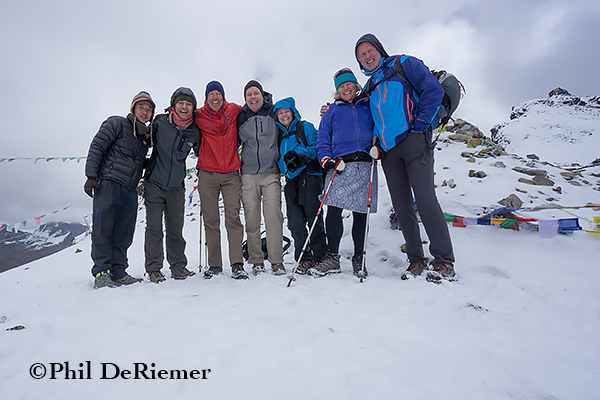 We were a team of six made up of one Canadian, one Bhutanese and four from the U.S.. Thinley Thoben, Ben Morton and I were guiding Sarah Cunningham, David Lech and David Focardi. 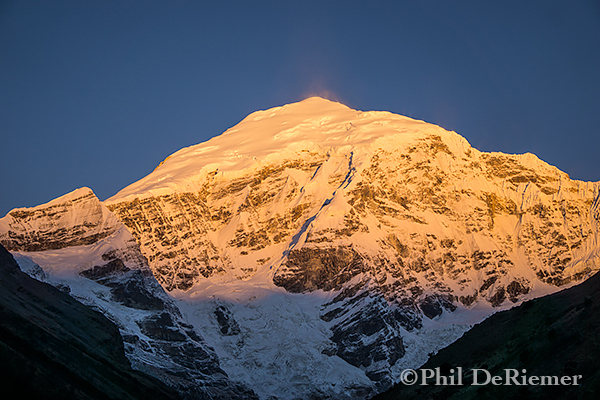 This was Sarah and Thinley’s first multi-day and the 1st time some in the group had done a first descent. I had become aware of the river in 2010 when I floated past its confluence while doing a multi-day river trip on the Drangme Chu, a drainage to the east. Curious to learn more about the Kuri, I had asked our Bhutanese outfitter, Ugyen “Yougs” Dorje what he knew. He gave me three important pieces of information: it hadn’t been done, he could get the permit and I was welcome to put together the first trip. 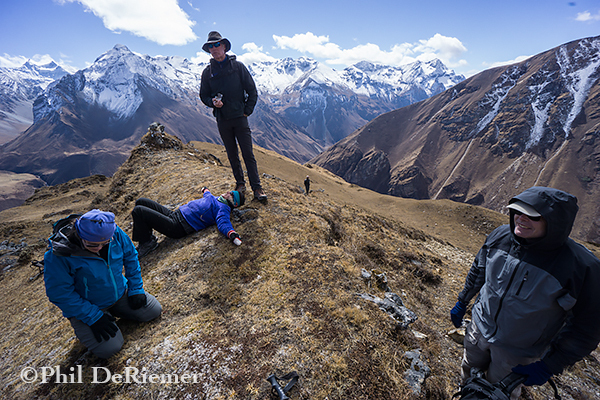 Our team L to R; Thinley Thobden, Ben Morton, Phil DeRiemer, David Lech, Sarah Cunningham, David Focardi. Ben got the group organized in eating a late lunch while Thinley and I floated downstream to have a closer look at this rapid. 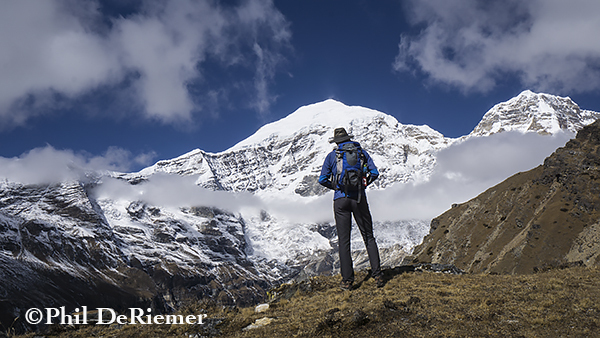 Without verbally communicating, I knew Thinley was also concerned about what it held, how we might get around it and how long it would take. 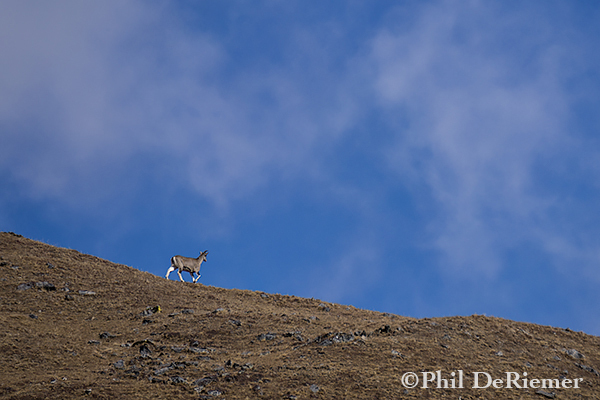 He popped out of his kayak onto the rocks to have a look just ahead of me. I kept an eye on him as I pulled my boat out of the water, watching his body English carefully to see what it might tell me of the rapid. After a short time he turned to me and flashed a big smile while giving the “thumbs up” with one hand and tapping his head in the universal “O.K”. sign with the other. There was a way around this. 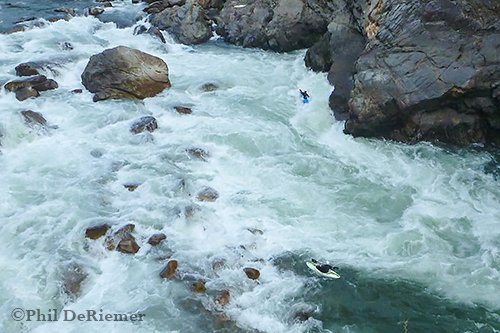 This wide rapid was broken by a ledge system, which in turn was sprinkled with numerous rocks, and holes. We were committed to running the left side. After a technical top section, the flow formed an intimidating pillow as it slammed into the left wall and exited in a 90-degree turn. The word sonam means good luck, the kind of “luck” that comes from good living. And right now sonam was with us! 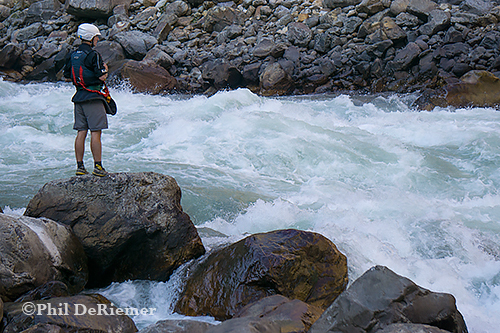 We could portage the difficult top part and put into an eddy exactly where we needed one just upstream of the pillow. This eddy would allow us one by one to get into our boat and execute a ferry in front of the cushion. This intimidating yet doable move led into the pool above the narrow gap. Failure to drive far enough out into the current would result in getting pushed back leftby the force field effect of the pillow. If that happened and the paddler was still upright, they’d have to scramble back into the eddy and get themselves psyched up to try again. David Lech takes it all in at the critical eddy toward the end of day one. We fire-lined the kayaks over the rocks and into position. Ben lead off with a perfect demo, always good for moral to see that first run go so well. We took our turns with no two runs the same. David F. had the most exciting run. He experience the “what if” line when he immediately flipped upon entering the current, rolled, flipped again then disappeared our of view from those of us waiting below. It was a tense moment. David ended up out of his boat, all the pieces together in a pocket eddy against the left cliff wall still above the pillow. 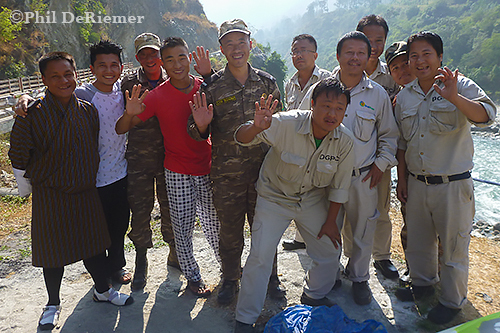 Thinley, who was running sweep, was able to scramble from above to extract him from the eddy and hike his boat back into position. Dave now had to try the move again- not easy after such an experience. The second run came up with the goods. He stayed upright long enough to hit the right side of the pillow. Our cheering echoed off the canyon walls. David F. makes a critical cushion move on the Kuri Chu. 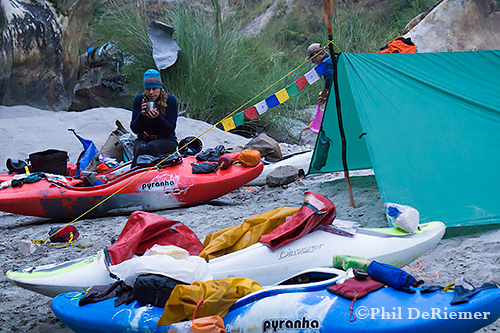 Now as we floated through the narrows and into the next rapid, our focus was to find a camp. 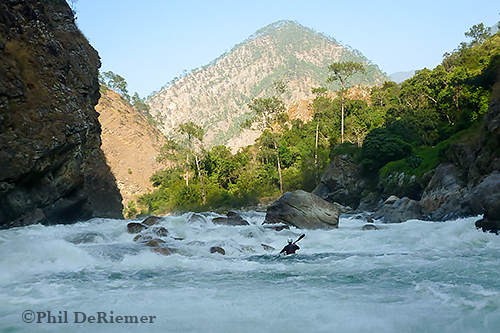 Once again sonam was with us when I followed my instincts and veered off to find a hidden pool at the top of a rapid. 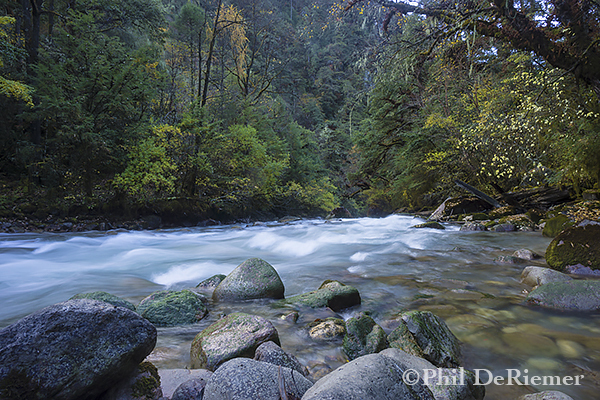 There, at the far end nestled amongst the rocks surrounded by the steep canyon walls, was a sandy beach. Home for the night! 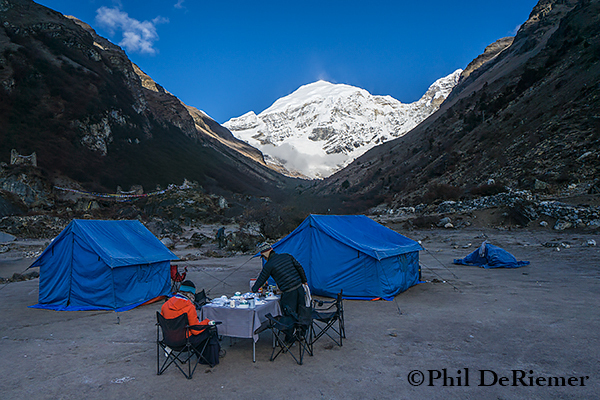 With dusk upon us we scrambled for driftwood and filtered water, settling into the routine of making dinner and setting camp as we relaxed into the beauty and magic of this most remote place. Sarah C., cocoa never tasted so good. End of day one on the Kuri Chu. 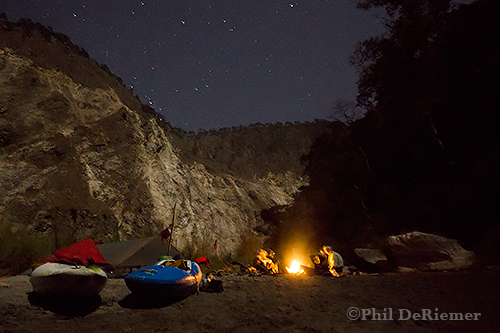 Clear night in the Kuri Chu canyon. Packing boats on the morning of day two. 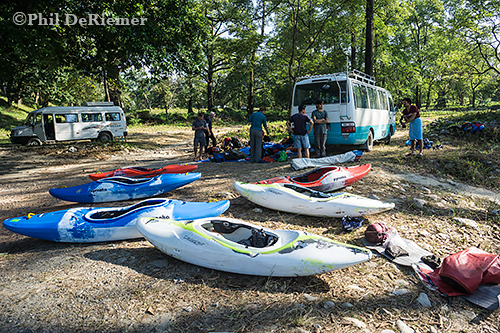 The 3-day descent included a day and a half of paddling 20 miles of the Kuri Chu and a another 30 after joining with the larger and easier Drangme Chu. 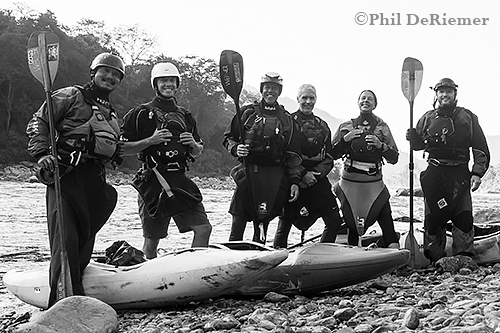 We reached the confluence at 4:00 p.m. the next day after a full day of challenging and rewarding rapids. 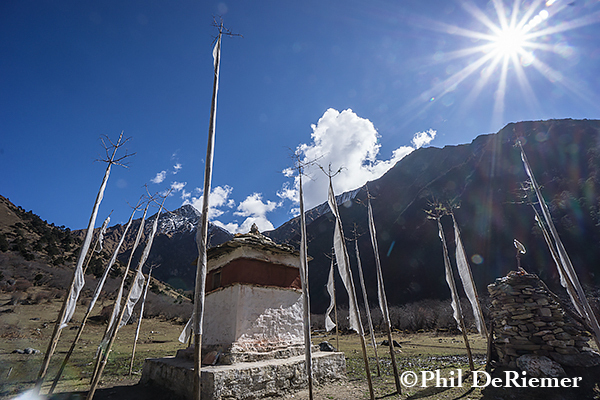 It was in this place 5 years earlier, during a descent of the Drangme Chu with Thinley that he and I first peered curiously up the Kuri and wondered about it’s rapids. 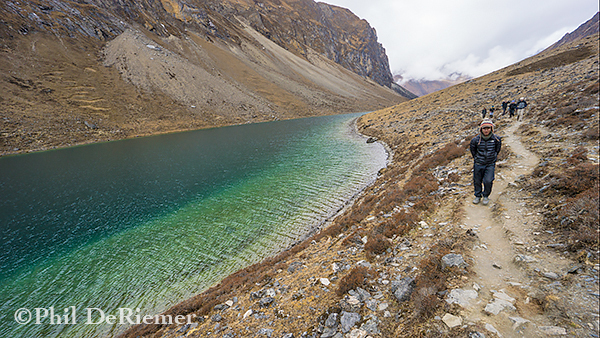 Now, five years later, we could see some significant changes had taken place as roads were being built on the steep sides of both rivers where there had once been only forest. A dust storm blew up the Drangme as workers cleared a freshly blasted area. 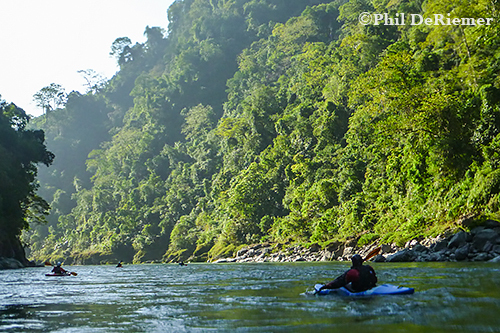 The threat of rock fall kept us moving, robbing us of a chance to absorb the energy of the bleanding of these two rivers. The hard rapids were behind us and the group was keen to put in another hour so as to nibble away at some of the last day’s mileage, so we pushed on and made camp in the dark. Dust from road construction on the Drangme Chu blows up river at the confluence with the Kuri Chu. As we broke camp our last day the view downstream was already very different than the previous camp. The air was warmer and the banks were lined with thick tropical vegetation. This is tiger country. The topography was easing back and we could sense the river canyon giving way to the flats of India. During our final day, our driver Shatu and our cultural guide Kinga were finishing up an adventure of their own. 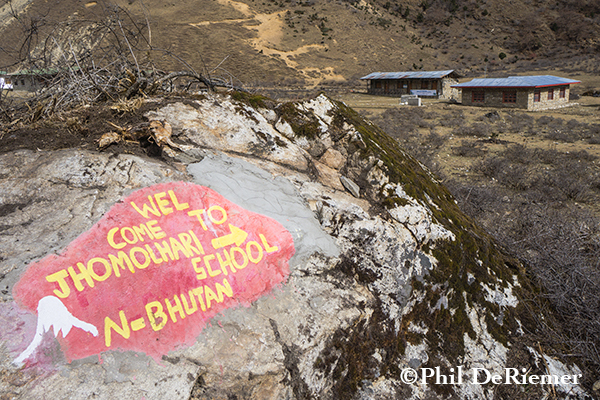 Bhutan’s rugged terrain meant they had to drive for 2 ½ days to meet us at Manas National Park, our take-out on the Indian side of the border. As we approached the take we could see their silhouettes enthusiastically waving from the shore and feel the warmth of their smiles. 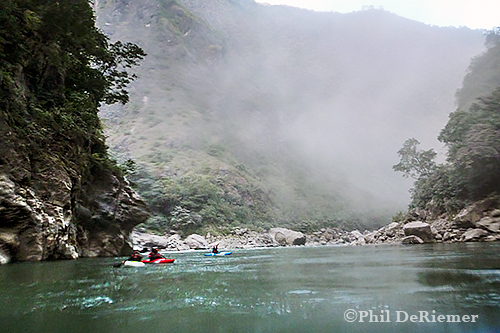 Paddling the Drangme Chu en route to the border with India. It was starting to fel pretty tropical. End of the line. Derig on the Indian side of the border. Our trip had begun in Paro far to the west, on the other side of the country. Had we driven it in one push, it would have been three long days of continuous driving over winding, mountainous roads, and crossing numerous passes. 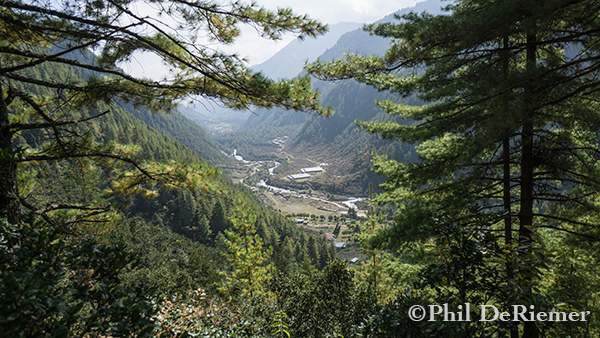 Fortunately the Drangme Chu and Kuri Chu are only two of many incredible rivers Bhutan has to offer. 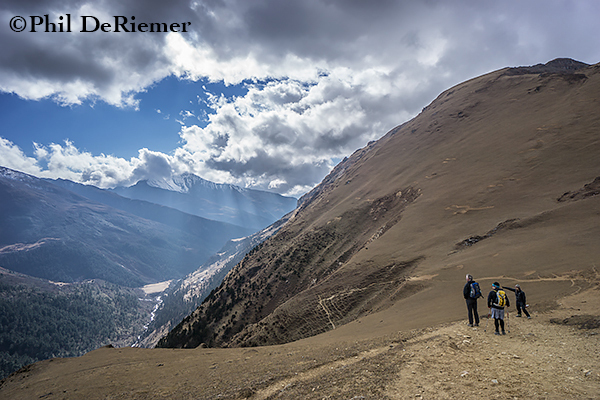 With the Himalayan range and Tibetan Plateau as their source, the rivers flow north to south before spilling out into India. 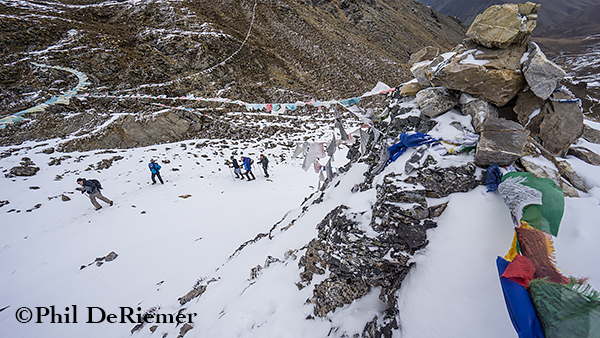 During our 16 days in country we took part in celebrating the fourth King’s birthday with the country and enjoyed a festival where few tourists ever go, we hit up eight awesome Class IV and IV+ runs as we worked our way east to this successful and rewarding run of the Kuri Chu. 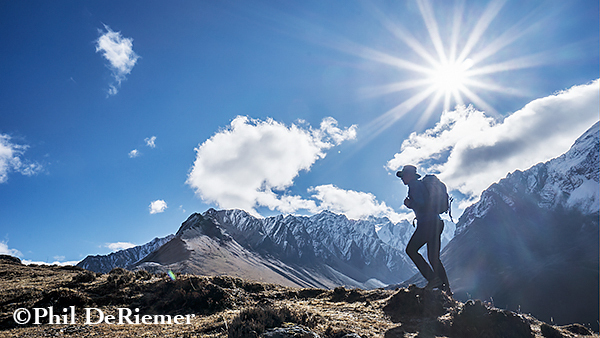 The Kuri may be the finest multi-day run I’ve done in Bhutan. 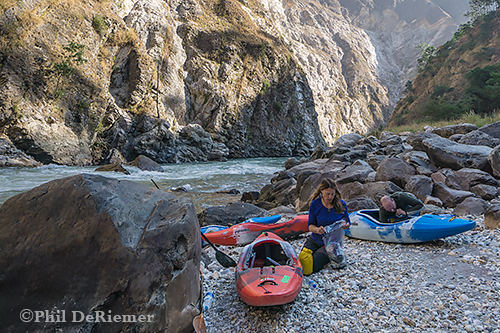 The quality of this river exceeded my expectations; numerous rapids at the class IV+ level, minimal portaging, stunning scenery, multiple days of living out of our kayaks and finishing in another country! I am already planning my return. 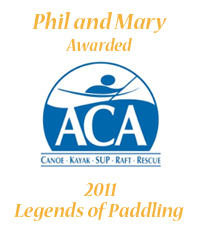 Phil and Mary Featured In Kayak Session Magazine. 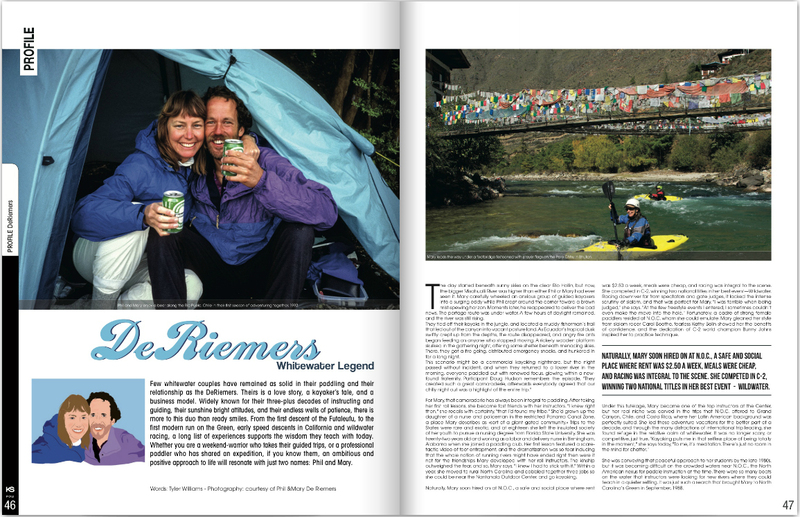 We are very flattered to be featured in a profile piece written by Tyler Williams in the summer issue of Kayak Session magazine. Check it out and learn a little about or beginnings as a couple and a business in this wonderful sport of kayaking. Click here for Kayak Session magazine. Spring Or Fall We’ve got A Grand Trip For You. We’ve doubled up on our offerings for the Grand Canyon by adding a trip in May. We’re still doing our annual fall trip, as a matter of fact we launch in just one week. The group from this year’s spring trip returned with stories of green water all the way to the take out, the magical turquoise water of the Little Colorado, blooming cactus and flowers, gushing side streams and warm days. May and September are great times of the year to be in the canyon. Temperatures are ideal and there are still plenty of daylight hours to fit in all kinds of kayaking, hiking and relaxing. 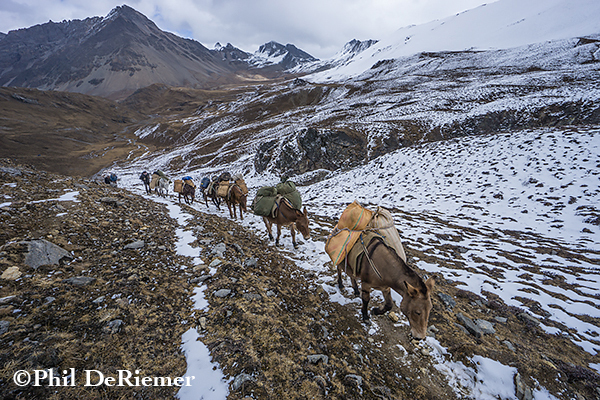 We hope you’ll consider joining us for one of these amazing trips. Check our website for dates and prices. 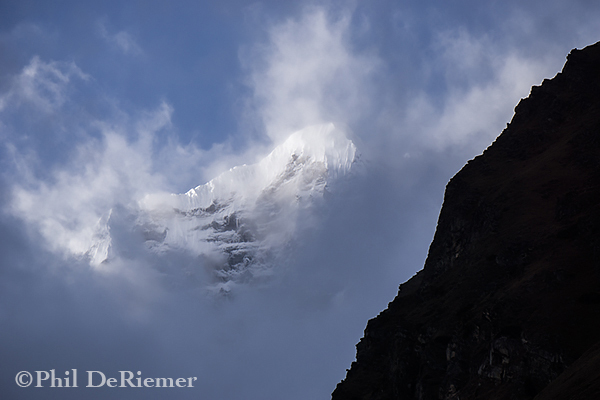 In the mean time here are shots from the trip we did this past May. Willis taking a break at the Little Colorado. Kayakers fall in behind the mother ship. Emily and Keith shifting into all terrain mode on a hike of Carbon Creek. Cactus in bloom, one of the benefits of a spring trip. 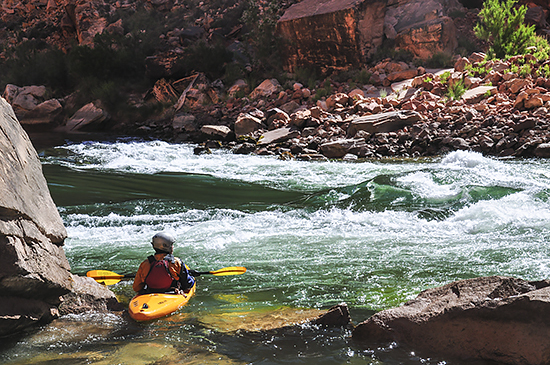 Kayakers at the mouth of Havasu Creek. Looking toward the north rim during a hike of Carbo- Lava/ Chuar. 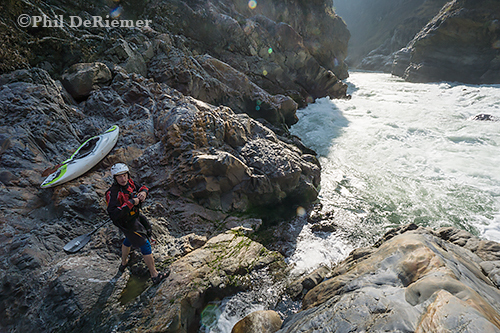 Except where noted Photos and content ©DeRiemer Adventure Kayaking all rights reserved.